People Capability Maturity Model (PCMM, People CMM, P-CMM) is a maturity framework that describes the key elements of managing and developing the workforce of an organization. It describes an evolutionary improvement path from an ad hoc approach to managing the work-force, to a mature, disciplined development of the knowledge, skills, and motivation of the people that fuels enhanced business performance. People CMM is a framework that helps organizations successfully address their critical people issues. Based on the best current practices in fields such as human resources, knowledge management, and organizational development, the People CMM guides organizations in improving their processes for managing and developing their workforces. The People CMM can also be used by any kind of organization as a guide for improving their people-related and work-force practices. 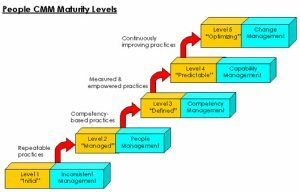 People CMM Maturity Levels : The People Capability Maturity Model adapts the maturity framework of the Capability Maturity Model for Software, to managing and developing an organization’s work force. PCMM has five maturity levels and each maturity level provides a layer in the foundation for continuous improvement and equips the organization with increasingly powerful tools for developing the capability of its workforce. The maturity level of the PCMM Version 2 is consisting the “22 Process Area”. The below depiction shows the name of all the 22 processes areas along with level.